The last thing you probably wanna do when you’re hurt somewhere is move it even more. No wonder this is one of the reasons behind employees missed work since chronic pain can be really debilitating. Aside from that this is the reason why most people suffering from pain prefer to just take pain medication too because it takes away the pain without having to do anything. However, what you may not realize is that all pain medications do is numbs the pain for a while and nothing more. It doesn’t treat the cause of your pain nor keep the discomfort permanently. Aside from the fact that long term use of medications can pose different kinds of side effects that can be dangerous for your health. 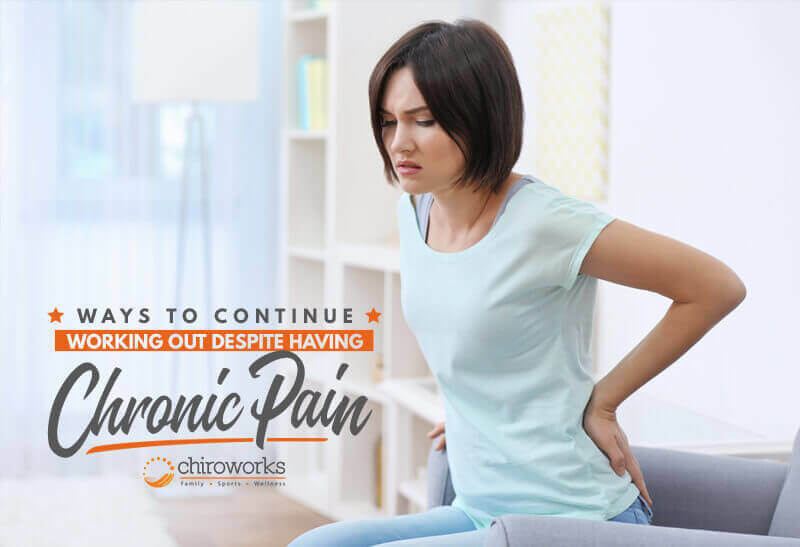 If you want to address your chronic pain properly, you have a better chance at getting better if you seek chiropractic care and do tailored exercises for your condition. But how do you do it when you’re in so much pain? Here are some tips to help you stay active and overcome chronic pain. Before starting any kind of fitness program, it’s always a must that you consult your doctor first especially if you’re a chronic pain sufferer. This is because just as an exercise can help you, it can also hurt you when you train the wrong parts or overdo an exercise especially if the workout isn’t tailored to your condition. Results won’t happen overnight. So don’t assume that you have to force yourself into an intense training right away. Gradually work your way into your target frequency and intensity to help your body get used to working out. Otherwise, you’ll shock your body and cause further pain which will result to losing your motivation. If you work out with a group, don’t try to train as hard and as long as the rest of the group do. Remember that every individual’s fitness goal as well as physical conditions are different. So there’s no point in trying to keep up with other people when exercising. Just focus on the fitness programs that’s tailored to you and the result that you want to achieve. Your performance level doesn’t have to be the same all the time, but you should at least do a little exercise every day. Because a 5-minute workout is always better than nothing. But if your body is screaming in pain and you can hardly move a muscle, listen to your body and rest. Pushing yourself too hard isn’t good either. Cardiovascular, strengthening, and stretching exercise are the three main components of exercise. So when starting a workout regimen, try to include exercises that allows you to do those three. Or you can do different activities like running (cardiovascular), weight lifting (strengthening) and yoga (stretching) on alternate days. Chronic pain means you may have to deal with the pain for a long period of time or even for the rest of your life. But not all days are the same. So take advantage of the days that you feel good or even somewhat okay and exercise. For those days where the pain is almost unbearable, take it easy and rest. Don’t feel discouraged when you can’t exercises for a day or a couple because of the pain. Accept them instead and pick yourself back up again when you’re feeling better. Again, success and results don’t happen overnight. Pushing your body too much won’t do any good but make your pain worse or even lead to injury. Just take it one days at a time and you’ll soon get there. Even if you have already consulted your primary health care provider, seeing a chiropractor here in Singapore would also benefit you. Because they may see something that your doctor have missed since chronic pain is usually due to musculoskeletal issues which chiropractors specializes in. A chiropractic doctor will conduct physical examination in order to arrive with an accurate diagnosis of your pain. Once a chiropractor knows your what your pain condition is, he will develop an individualized treatment plan that he’ll explain and suggest to you.